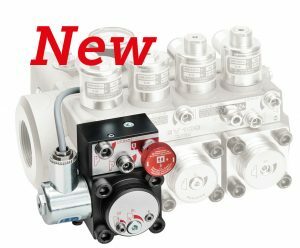 iL10 Description: The iL10 flange is a solenoid operated lock valve designed as a safety option against Unintended Car Movement (UCM) for hydraulic elevators. It includes all standard EV valve adjustments as well as a self-closing manual lowering valve. Its purpose is to provide additional safety to lock the down piston X at its closed position via a lock piston LP in case of UCM situation or while the lift is stationary. Down movement of the lift is only possible by energizing down solenoid coil D on the control valve and the solenoid coil A3 on the iL10 flange. The iL10 can be mounted on any Blain EV, SEV and EV4 type valves at the size of 1″, 1.5″ and 2″. The existing Blain valves are easily upgradable to satisfy UCM safety by the replacement of the typical EV down flange with the iL10. A Slack Rope Valve KS for roped elevators (e.g. 2:1 indirect transmission) is optional. It prevents the slack rope condition caused by the lowering of the ram when the car is suspended in the safeties or resting on the buffers. Coil voltage ~ (IP 68): 24 V/1.8 A, 42 V/1.0 A, 110 V/0.43 A, 230 V/0.18 A, 50/60 Hz. Coil voltage = (IP 68): 12 V/2.0 A, 24 V/1.1 A, 42 V/0.5 A, 48 V/0.6 A, 80 V/0.3 A, 110 V/0.25 A, 196 V/0.14 A.